FOREWORD: Roots-y Country-Blues devotee, Jolie Holland, utilizes primal Jazz, rock, neo-Classical, and vaudevillian sources to get across her unconventional musings. Treasured beatnik crooner, Tom Waits, became a fan when he heard Catalpa, a scrappy homemade recording. I got to speak to Holland prior to a Maxwells gig in ’04. She was supporting her first proper studio album, Escondida. Thereafter, she only got better, as ‘06s Springtime Can Kill You and ‘08s The Living And The Dead attest. This article originally appeared in Aquarian Weekly. Sometimes the past refuses to recede in our memories, reassuringly taking us back to an innocent time when skies were bluer, air was cleaner, and grassroots music more genteel. Bringing back the spirit of those witheringly weathered days is Jolie Holland, whose euphonic inflections and old timey visage revisit, rekindle, and re-acknowledge well begotten olden relics. Born and raised in Houston, the singer-guitarist-violinist then spent adolescence in a family-owned east Texas home just a few hours northwest of musical Mecca, the Big Easy. Her initial public performance in a local band (as rhythm guitarist) happened at the tender age of sixteen before subsequently securing several solo gigs. Though Holland’s parents assumed she’d attend college and land a high powered corporate job, the free-spirited bohemian began paying more attention to the ragtime Blues of guitar pickers Blind Willie Mc Tell and Elizabeth Cotton. Captured in a living room, the resulting Catalpa was then given proper release by Waits’ current label, Anti (a subsidiary of established L.A.-based indie, Epitaph). Interspersing hokum Country alongside modern folkloric peculiarities, its courageously naked rural-bound compositions express intimate confidentiality and draw frank comparisons to Alan Lomax’s archaic field recordings. 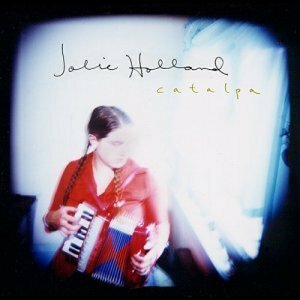 In November ’03, Holland entered a formal studio with veteran Jazz drummer Dave Mihaly, fellow six-stringer Brian Miller, and other recruits for the lovely Escondida. From delightful Cajun waltz, “Sascha,” to flickeringly tingled sedation, “Darlin’ Ukulele,” and lonesome bluegrass refuge, “Faded Coat Of Blue,” her cherished cabaret poignancy reveals astoundingly plaintive vulnerability. In spite of its homey upbeat Tejano feel, “Goodbye California” deals with untimely suicide, perhaps paralleling the Piedmont-forged death tales of yore. Wearing an antiquated petticoat dress, knee-high stockings, golden brown shawl, and black granny shoes, the bespectacled, full-figured bumpkin held the half-seated crowd in the palm of her hand at Maxwells in Hoboken, hypnotizing the awestruck minions with understated poise usually reserved for torch song bearers twice as experienced. Holland’s witty self-deprecation, genuine wide-eyed smile, and hippie-esque vagabond countenance kept the audience engrossed despite flubbed improvisational attempts at familiar rudimentary originals and one temporary mid-song bungle. Notwithstanding these few errors, Holland’s sweetly demure voice possessed this backroom club whether she served up back porch folk, melancholy Western swing, or operatic Jazz. She broke out a violin for a Native American instrumental dirge that slipped into the somber “Alley Flowers.” When her violin fucked up during another number, she recovered brilliantly, succinctly freestyling a cappella lyrics to eventual applause. The sullenly majestic “Drunk At The Pulpit” satiated silenced attendees as a supinely restrained encore. Why’d you move from the Louisiana-Texas Jazz-Blues hotbed to San Francisco? JOLIE: I love New Orleans, but to live there, what job would I have – working in a bar around drunken people. I settled in San Francisco and was introduced to amazing musicians I wanted to work with. Then you moved to liberal-minded marijuana vista Vancouver to be in the Be Good Tanyas. Were you also a stoner? No. I’m extremely moderate. I lived in a rough neighborhood – 50% HIV rate. It was hard to go out at night because there were junkies everywhere. But I met great people and wanted to see what the city was like. I’m back in San Francisco living at the Golden Gate panhandle. It’s a tourist-y area. Are Jazz-folk singer-songwriters such as Joni Mitchell or Rickie Lee Jones influential? I hate Joni Mitchell. I respect that people like her but she’s not singing to me. I can’t stand Rickie Lee Jones. I’d like her if I could understand what she was singing. I’m from the street so I wanna hear what you’re singing or I won’t drop money in your hat. When you mumble, it makes people think you’re not serious. But I look forward to hearing her new album. Most radio songs are bad and the Blues stations play boring new stuff. I didn’t even realize there was good rootsy Blues until a friend turned me on. Since Catalpa was recorded in your living room, will those songs ever be given proper studio treatment? My band’s really creative and versatile. Every song I’ve recorded I’ve done 20 different ways. I’ve done Catalpa songs with huge horn arrangements or with guest rappers. I probably will re-record some differently. “Sascha” and “Poor Girl’s Blues” are the oldest songs I’ve ever recorded. Getting to Escondida’s nitty gritty, you begin with “Sascha,” a diva-esque torch song. That’s an early Jazz-pop-styled tune. It’s inspired by anarchistic New York writer Sascha. We hung out and had a sweet relationship that motivated me to move out of Vancouver. “Sascha” represents me having a melody in my head and not knowing how to put chords behind it. It had seven chords – which is a lot for a song. I learned more about musical theory before I could finish that. “Old Fashioned Morphine” reminded me of Billie Holiday, who struggled with heroin addiction. I love Billie Holiday. But that song doesn’t refer to recreational morphine use. I’m using it metaphorically. I wrote that to amuse myself while waitressing. I’d just read a book about medicine history and my grandfather had just spent his last months on morphine. Its post-midnight trumpet setting comes closest to Tom Waits’ oeuvre. It’s funny you mention that. The trumpeter is my friend Ara (Anderson), who was lucky enough to get called by Waits to play on his last two records. Are you into similarly styled folk troubadour John Prine? Does the lilting velvety piano ballad “Amen” come from Gospel spirituals? The most direct inspiration is (acid folk weirdo) Michael Hurley. I love his records. He inspired “Amen’s” wacky arrangement. When you listen to his songs, structure seems to make sense, but then it jumps out of key in strange moments. His songs have an internal sense, tight flow, and strong nucleus communicated in a strong way. He’s so inspiring. “Amen” was written off the top of my head on a full moon night on piano at a crazy practice with his principles in mind. Then there’s “Poor Girl’s Blues,” a down home Appalachian folk-Blues tune. At the time in ’95 (when it was written), I was listening to early Dylan, like Freewheelin’ or Another Side. The quietly strummed gentle persuasion, “Do You?,” has a hushed lilt Norah Jones would appreciate. I don’t know her but I have 10 friends in common with her. I was in a band with someone who wrote “If I Were A Painter” for her first album. I’m a friend with her first manager. She’s in the family, coming out of a musical circle I stepped into in San Francisco. People are annoyed they hear her too much. But she’s younger than me and I’ve been around longer so she’s not an influence. Are you into British Isle folk by Fairport Convention or Richard Thompson? Be Good Tanya’s “The Little Birds” was up for best song on BBC, but we lost to (Thompson’s ex-wife) Linda Thompson. I don’t know what she sounds like. I’m so broke (I can’t afford records). How might future recordings differ? I have different ideas. I have an unreleased live record. There’s an element of sketchy rock and roll not represented on either of my first two records so I wanna lay down that rock sound I represent live. I also wanna do a pristine Jazz-slash-Country record with dance songs you could imagine couples dancing to wearing tight jeans.